In Avondale, Arizona, understanding the core differences between legal separation and divorce are key when you are having trouble in your marriage. The differences are huge and there are many misconceptions around both of the terms. Before you contact a divorce lawyer to file for divorce from your spouse, you should learn a little bit about legal separation and how it may be a better or worse road to take during this difficult time with your spouse. A divorce is a legal dissolution of a marriage by a court of law. A divorce seeks to completely separate two parties in a marriage, along with their assets, finances, and child custody distribution. A divorce is a final complete separation of two married persons. Legal separation is an arrangement initiated by one or both parties in a marriage. This arrangement makes it legal for the couple to live apart, yet still remain married. Legal separations typically take the same length of time to complete as a divorce, despite the misconception that it is quicker and easier. Legal separations also tackle the same legal issues as a divorce, including child custody and support, spousal maintenance, and division of debts and assets. Legal separations are also rarely less expensive than a divorce. Many people will ask a divorce lawyer if they should pursue a legal separation before pursuing a final divorce. More often than not, this is actually a very poor idea. Legal separation, especially in Avondale, is rarely seen as a prequel to divorce. Rather, it is seen as an alternative. Legal separation, though slightly less traumatic and difficult than a divorce, is a complicated feat in itself. To file for divorce is a bit more final, but the two ideas are relatively the same. The big difference between legal separation and divorce, and why people choose one over the other, lies in the concept of agreement. In Avondale, legal separations are only tangible when both members of a marriage agree to it. If one party wishes to go through with a divorce rather than a legal separation, legal court will order that the case be transferred to a divorce case. For this reason, legal separations are rare in Avondale. Rather than going through with a legal separation as a precursor to divorce, couples will avoid the mess altogether and usually work their problems out or go through with divorce proceedings. If one member of the marriage feels unsafe or totally miserable with the other person, divorce proceedings will be much more common than trying to get a legal separation. Why would someone want a legal separation instead of a divorce? Religious beliefs. Some people adhere to religious dogmas that prohibit divorce from their spouse. Legal separation is a way to stay committed to the faith yet receive the benefits of divorce. Since legal separation requires cooperation of both parties, it is usually sought out by couples that follow the same religion and adhere to similar beliefs. Insurance. In rare cases, people with chronic or life threatening illnesses will seek out a legal separation to remain on their spouse’s medical insurance. If one divorces their spouse, they will lose such insurance privileges. This, of course, must be an agreement between both parties, as legal separation in Avondale can only go through if both parties agree to it. Reconciling differences. Sometimes, although it is not really suggested, couples will agree on long term separations though legal separation to work out their marital differences. This will either end with the couple filing a stipulation to remove the decree of legal separation and become married again, or the couple will divorce. I need a good divorce lawyer. Who can help? 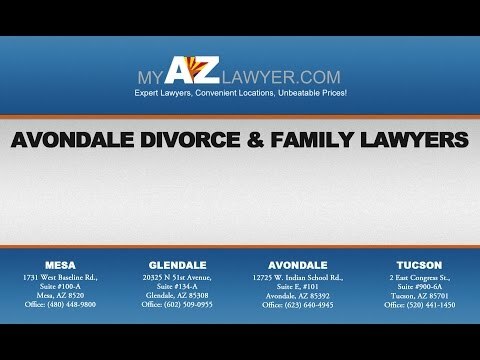 My AZ Lawyers features a team of experienced, talented, and focused divorce lawyers in Avondale that are well versed in divorce and marriage law. My AZ Lawyers serves clients all over the Valley and other places in Avondale, including Tucson, Phoenix, Mesa, Chandler, Gilbert, Glendale, Avondale, and Scottsdale. When you need help making the big decisions surrounding your potential legal separation or divorce, trust Avondale’s own My AZ Lawyers to help you. Give us a call today to set up a free consultation.